The 4th edition of the app festival ORGANIC: The App Party took place 15th of November 2018 in Duvet Club Barcelona. Case Studies, Fun and a Lot of Networking! Also, this year Pickaso and The Tool, the organizers of the event, introduced TheAwards18: best mobile apps and mobile games in Spain 2018! And in this article, you will find all the highlights from the event as well as Award winners, sponsors, jury members and many more! ORGANIC is an app festival with the aim of sharing the latest trends in the mobile sector and encouraging networking among attendees in a fun environment with DJs, cocktails and good food. Apiumhub team couldn’t miss it and we should say that this event exceeded all our expectations. Everything was very well organized! Worth attending talks, prizes, excellent catering and absolutely amazing chance to do networking, because all attendees were from the mobile world and it was very interesting to speak with all of them! A lot of fun, unexpected surprises and laughs. Mobile leaders from Privalia, Scoot, Appsflyer and eDreams ODIGEO shared their mobile strategies, experiences and insights. It was a very useful session, where we could actually learn from the best ones in the industry. Aurembiaix Puigpinós is the marketing director of the vente-privee group where she manages the digital strategy of the Privalia and vente-privee brands in Spain. Andrea Vian is a Digital Marketing professional with more than 10 years of experience gained in online international business. Five years ago he joined eDreams ODIGEO, one of the largest online travel companies in the world, specializing in the area of Digital Acquisition. He currently leads the Mobile Marketing team, managing APP Growth projects for the different brands of the group. Anna Juan leads Scoot’s marketing team in Barcelona and is responsible for the growth of the company. Diana Rubine is a CSM at AppsFlyer in Spain. She has more than 10 years of experience in positions of a direct relationship with clients. She has a deep knowledge in digital marketing, user acquisition, and branding, both web, and mobile. This year there was an inauguration of the awards for the Best Mobile Apps in Spain 2018. And it was more than cool! A lot of intrigues, competition and happiness. 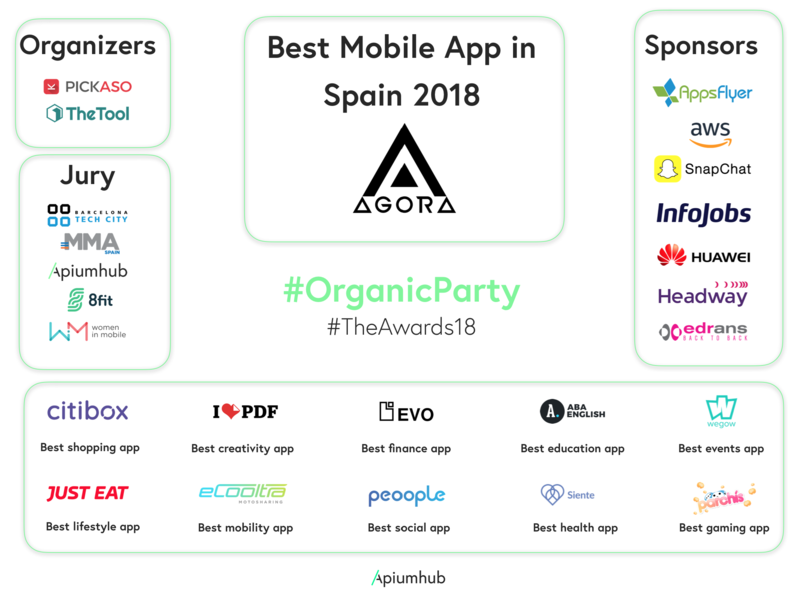 The first part of the “best mobile apps in Spain” selection was done on theawards.app website, where different mobile apps could register themselves and participate. Here you may find the example. The 3 finalists per each category ( shopping, creativity, finance, education, events, lifestyle, mobility, social, health and games ) were chosen according to a number of hearts/votes they had. During this stage all people could participate, users and non-users, to vote for their favorite app. And then, the Jury Board selects the best Spanish app of the year, as well as the best app per each category, analyzing the finalists: product, usability, design, marketing, originality. Mobile professionals from different industries were invited to become a jury to select the best mobile apps in Spain 2018. Vanessa Estorach is a co-founder of Women In Mobile and a mobile strategist, who founded her mobile marketing agency. She is an entrepreneur and a tech lover. She always looks at the IT industry from a strategic point of view. Also, she mentors several startup accelerators and gives speeches at international conferences. Ricard Castellet is a CCO of Barcelona Tech City. He has more than 20 years of experience in the digital world, launching startups and working on the digital transformation of big companies. Right now he is in charge of positioning Barcelona as one of the main technological hubs in the world. Evgeny Predein is a Co-founder & CEO of Apiumhub. Evgeny Predein is an entrepreneur, he started his career as a software developer right after completing his master degree in Helsinki. After working for different big companies, he entered the startups world and discovered new technologies and methodologies. He saw the quality software gap in the industry and decided to launch his own company focusing on scalability and high quality. Also, he takes care of the ROI of customers in terms of technological development and investment, ensuring that the working software that is delivered has the desired impact. Right now, Apiumhub offers mobile & web development, software architecture, DevOps and PO services. Elia Méndez is a managing director of MMA Spain. She has more than 30 years of experience in the fields of marketing and communication and more than 25 in management positions, developing digital and communication strategies. She has worked for different companies, mainly multinationals in the technology sector such as IBM, Intergraph, Digital, Amadeus GTD or Baxter, as well as in sectors such as Pharma in Baxter or in Banking in Caja Madrid and Bankia. She is currently the General Director of the Mobile Marketing Association in Spain (MMA Spain). She also runs a small consulting firm Senyakue, which is dedicated to providing digital services mainly to SMEs. Other than that, she is a Professor and gives classes related to digitization, both in companies and in business schools. Thomas Petit is Growth team member at 8fit. Thomas has more than 10 years of experience in digital marketing and startups world. Thomas loves experimenting with ASO and currently works as a member of the Growth team at 8fit, one of the top 25 applications in the Health and Fitness category. Agora Images is the first global image community where customers can buy and sell their pictures with no middlemen, and no commissions. It is a photo app installed in Barcelona, that has become an online marketing channel for the photography industry, companies, and brands. Agora Images has a creative team, aiming of democratizing the world of photography. They are disrupting the industry, allowing people to make money with their best photos. Photographers can upload their best photos to the application and participate in brand-sponsored contests to earn money, life-changing experiences and other rewards. And users can vote for the best photos, having fun while posting quality content. Watch this Video to know more about them. Available in iOS & Android. Many companies wanted to support the winner and the prize ended up being worth 66.500 euros, wow! $ 20,000 in promotional credits to use in any of the AWS services, valid for two years; $ 5,000 in promotional premium support credits, valid for 1 year; AWS Business Essentials online training (valued at $ 600), AWS Technical Essentials online training (valued at $ 600), 80 credits for access to labs (valued at $ 80). Featured in AppGallery of Huawei valued at € 10,000 and diffusion of the app on social networks. Software architecture consulting valued at € 1920, 1 article on the blog & mention in the newsletter. $ 5,000 (€ 4337.57) free credit on the platform. Free consulting for your cloud project (in Amazon Web Services) valued at € 2,500. A prize of € 1,000 in credit for the winner, valid for 6 months for existing customers and new customers. 4-hour training on ASA and ASO. As we mentioned before, jury board selected the best category apps out of 3 finalists that got the biggest number of votes. The main criterias were: product, usability, design, marketing, originality. Each category winner also received a prize package, worth € 16,000. $ 3,000 promotional credits to use in any of the AWS services, valid for two years; $ 5,000 premium support promotional credits, valid for 1 year; AWS Business Essentials online training (valued at $ 600), AWS Technical Essentials online training (valued at $ 600), 80 credits for access to labs (valued at $ 80). 1 free license for 1 year valued at 1,200 $ (1,041.02 €). 3 months of free subscription to the Ninja Plan valued at € 597. € 500 of credit to use on the platform. 1 year of free subscription to the 20m plan valued at € 216. Also, we created a visual graph, showing you in one image, all the organizers, sponsors and best mobile apps in Spain! If you are interested in knowing more about best mobile apps, I highly recommend you to subscribe to our monthy newsletter here.